Whether you love or hate her music (we, quite honestly, have avoided it at all costs), you have to admit that Lady GaGa has a rather…interesting personal style. 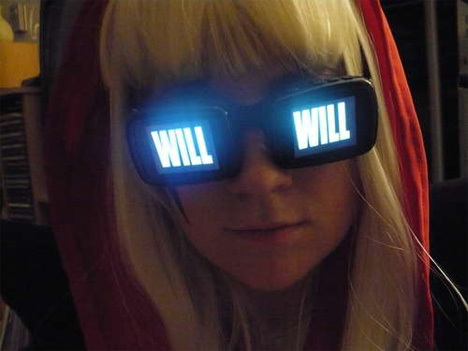 In particular, she wears a pair of hilarious video glasses for some of her performances. She obviously can’t see a damn thing out of them, but they look kind of awesome from this side of the clearly-dangerous lenses. 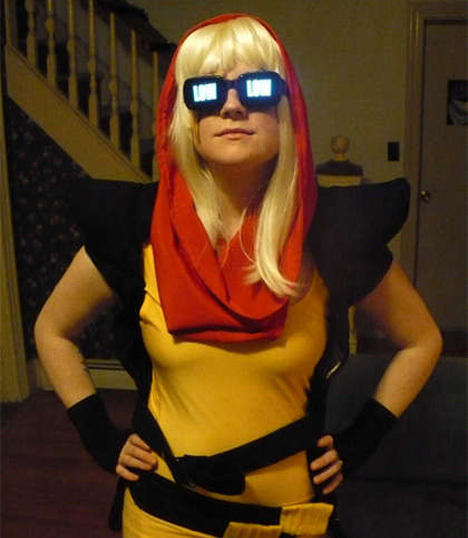 So if you are into emulating pop stars who are probably best off not being imitated, helpful Instructables member Angela Sheehan has kindly offered up her solution for making your own pair of “video” glasses at home. They involve little more than a couple of small digital picture frames, some giant sunglasses…oh, and the willingness to surrender your dignity. According to Sheehan, the screens aren’t synced; she just loaded them with the same sequence of words, then pushed the “on” buttons for both simultaneously so that the words would scroll at the same time. Despite our obvious dislike for the original wearer of these specs (and the inherent danger in completely covering your eyes), we have to admit that this is a pretty cool idea. Just…don’t tell anyone we said so. See more in Do It Yourself or under Technology. January, 2010.